The festive season may be well and truly over for another year, but as we stumble out of the haze of our Christmas celebrations and New Year resolutions, All Slots is keeping the excitement alive with the addition of its awesome new promotion, the Wheel of Wishes. From December 27th until January 31st, you can win prizes every few days by spinning the wheel at AllSlotsCasino.com, granting such wishes as free spins, free money, cash back offers, extra loyalty points, loyalty multipliers and tickets to the upcoming Stardust draw. 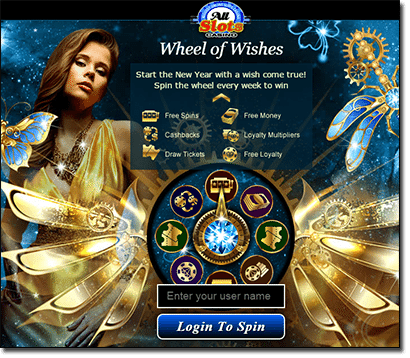 As the name suggest, the Wheel of Wishes works in a similar way to the Wheel of Fortune, but instead of physically spinning the wheel all you need to do to win is to opt in via the Wheel of Wishes promotional page on AllSlots.com and enter your user name. You’ll then be redirected to the Wheel of Wishes, where you can click to spin and await to see which awesome casino bonus comes your way. If you’re not sure when the next promotional round begins, just check back on the Wheel of Wishes promotional page at any time to get a live countdown of how long until the next round takes place. There are a couple of stipulations to keep in mind, for example, free spins for desktop players can only be used on Bridesmaids, Avalon, Immortal Romance, Gold Factory and Ariana, while mobile users are restricted to playing free spins on Avalon and Bridesmaids. You can check the full terms and conditions on the All Slots website. One of the highlights of this already outstanding promo is the Stardust Draw, which is taking place on January 31st. There’s a tonne of cash prizes to be awarded at random and you can get your name in the draw in a couple of ways. For every 50 loyalty points you earn during the promo period you’ll automatically receive an entry ticket, and you can also spin the Wheel of Wishes to land on a Stardust draw ticket to receive a raffle ticket. The Wheel of Wishes is already half way through, so head to All Slots to opt in today. If you’re not a registered member with All Slots, follow our links to sign up and you’ll be warmly welcomed with up to $1,600 in matched deposit bonuses to kick off your experience. All Slots is a safe and reputable casino powered by Microgaming, making it a firm favourite amongst online pokies players. You’ll find all kinds of great pokies games to choose from, including popular titles like Mega Moolah, Tomb Raider, Girls with Guns, Thunderstruck II, Jurassic Park and many more. Head on over to AllSlots.com today and opt in or sign up and spin the Wheel of Wishes to start 2016 off with more bang for your buck.